If 'Unchained' succeeds at anything, it's in demonstrating just how many players there are milling around the zone of the television landscape that Arrow inhabits. And from the look of things, it's pretty enormous. The episode features guest appearances from just the core Arrow storyline – not The Flash or Legends of Tomorrow – and it seemingly has more characters than you can shake a shared universe at. There are so many supporting roles on display here that the episode even has to make time for a hallucination within a hallucination, so that it can bring back Shado, as a means of underlining Oliver's tendency to carry the weight of the world on his shoulders – not that 'Unchained' had any problem expressing that very notion several times over in far less subtle ways. The episode is primarily about table setting. 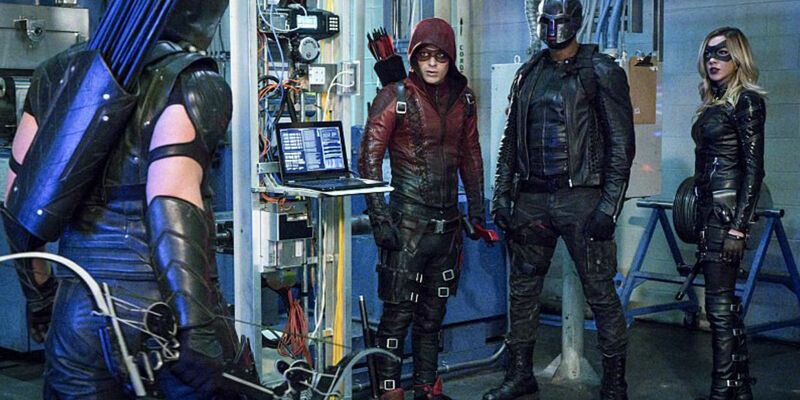 There are little bits of everything that will likely comprise the weeks to come, like Thea's worsening condition, Damien Darhk's wife entering the Star City mayoral race, Nyssa al Ghul making Oliver a deal he can't refuse, and Felicity running into her dear ol' dad – who just so happens to be a cyber criminal (watch out Patricia Arquette and James Van Der Beek) known as The Calculator. As it turns out, The Calculator plans to bring down Star City with a "web nuke," and he's even blackmailed parkour master Roy Harper in order to secure the pieces he needs. It's an ungainly bit of plot maneuvering (because, really, how many guest stars does a single episode of Arrow need? ), but the hour still manages to make the return of Colton Haynes feel like some sort of homecoming. Any other television series might have made an hour out of the return of a character like Roy, and maybe sought to explore what's been going on with him since he passed down his red leather outfit to his ex-girlfriend and went into the superhero version of witness protection. Instead, Arrow uses Roy as another piece of the puzzle, a way to introduce the next villain, who thankfully isn't just another delivery from the bad-guy-of-the-week club. Still, while he's little more than a convenient narrative door for The Calculator to walk through, Roy's appearance does offer a few nice scenes in which gets to pal around with the other heroes, and one where he and Thea ponder the lives they wish they could have led – possibly with one another – which adds an emotional undercurrent to Thea's rapidly deteriorating state. There's a level of sacrifice even supporting characters like Speedy and Arsenal have to deal with when they put on a mask and start taking down bad guys as part of a nightly ritual. Added to Thea's condition being the result of Ra's al Ghul's actions last season and she (like Roy) becomes kind of like a tragic figure – which is saying something, considering where the character started. But because so much of 'Unchained' is in service of what's to come, the emotional tenor of Roy's reunion with his friends and ex-girlfriend is only in service to a relatively small amount of the overarching narrative. That's because for all the guest stars and mapping out of future plots, 'Unchained' is mostly concerned with re-asserting Oliver's tendency to see himself as responsible for everyone and everything around him. This isn't an uncommon characteristic for heroes to have – especially when so many supporting characters surround them – and, for what it's worth, Arrow has played this card many times before. What makes this time different is that Oliver attempts to find a way to let go of his need to control everything, and to allow room for Thea (and others) to make decisions about their lives, even when it means making a choice Oliver doesn't necessarily agree with. In that sense, the island flashbacks work in terms of servicing the needs of this particular episode, though they feel oddly out of place with what the audience knows about Oliver's journey thus far – demonstrating the ongoing difficulties of trying to have the adventures of flashback Oliver inform on present-day Oliver in a meaningful way. It's safe to assume that these connections are going to become more and more tenuous as the show marches on, which isn't saying much, as the flashback narratives haven't been an essential part of the show since, say, season 2. These episodic successes are worth noting for their ability to emphasize what an individual hour is working towards, and that's something, but the fact that, in order to get everything lined up the way it needed to be, there had to be a double hallucination, sort of speaks to how inessential the flashbacks have become as a storytelling device. Beyond the narrative gymnastics being performed to make a single point about Oliver, 'Unchained' reserves some of its energy for pointing the audience toward higher stakes in the weeks to come. Nyssa's move to eliminate Malcolm Merlyn makes for a potentially exciting storyline down the road. Like most other aspects of the hour, the writing makes a point to highlight one specific character dynamic before threatening to blow it up. Here, Oliver and Malcolm interact like family members instead of onetime arch nemeses. Brought together by their shared interest in Thea's wellbeing, Oliver's "thank you" to Malcolm only feels forced once it's made clear his sister's best chance at survival comes from his killing her "evil dad." It's a lively hour, and yet, strangely, the one person missing from the hour is the liveliest of them all. Damien Darhk hasn't been seen for the last few episodes and his absence is starting to show. Now that Oliver has a more pressing mission ahead of him, there's a good chance Darhk and his H.I.V.E. operatives will stay underground for a while longer. While it's nice to see the series have such a pointed focus at this stage in the season, the sudden tunnel vision and lack of attention paid to story elements from just a few episodes ago points to the scattered nature of these lengthy seasons and how shows like Arrow would benefit from a reduced episode count.